Bryant Lady Hornets’ senior guard Kalia Walker doesn’t seem to mind coming in off the bench. Or, if she does mind, she doesn’t let it affect her. On Friday night, Walker entered and proceeded to lead all scorers with 17 points including a short jumper to snap a 34-34 tie in the final seconds of the third quarter, and a 3 early in the fourth that helped fuel a surge in which Bryant pushed out to a 10-point lead. The Cabot Lady Panthers gamely kept trimming the lead only to have the Lady Hornets make just enough plays in response to maintain a lead. Down the stretch, they converted just enough free throws to fend off their rivals in a well-earned 53-48 victory. The loss put a damper on the final visit to Bryant by former Lady Hornets’ head coach Carla Crowder. The Cabot mentor has announced she’ll retire after the season, her 38thin coaching. Along with Walker, Tierra Trotter finished in double-digits with 11. India Atkins had 9. The Lady Panthers were paced by their own sharp-shooter off the bench. 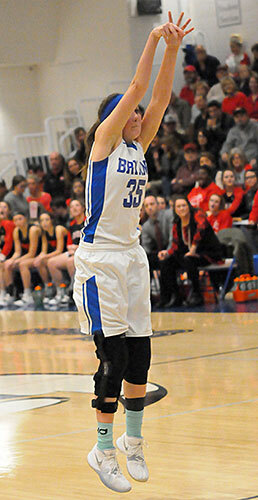 Anna Wilson entered and proceeded to score a team-high 16 points, matching Wilson’s total of three 3-pointers. Brooklyn Stracener and Izzy Arnold added 10 points apiece. With the win, the Lady Hornets pulled even with the Lady Panthers in the 6A-Central Conference at 3-2. Both are 12-4 as well. 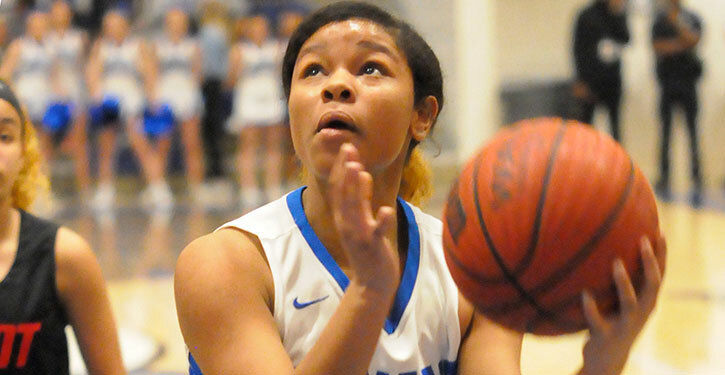 Last Friday, the Lady Hornets suffered a hard loss, 47-45, at home to Little Rock Central. 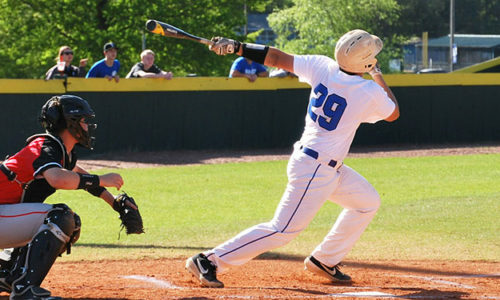 On Tuesday, they bounced back at Fort Smith Southside. Cabot downed Central on Tuesday so the Lady Panthers came in 3-1 versus the league. “After last Friday’s tough loss, it was really, really good to get a win this Friday,” said Lady Hornets coach Brad Matthews. “Two wins this week, you know, we’re just trying to get another win, get another win to get to the State tournament. “I was really proud of our kids,” he continued. “Kalia shot it really well. We had periods where we played really good defensively. It was a really good win. Cabot’s good. They were 12-3 coming in here. We beat a good team tonight. 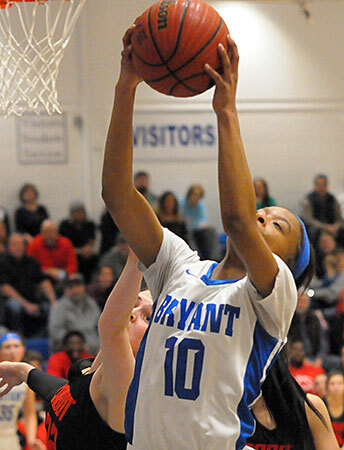 With 2:12 left to play, the Lady Panthers had whittled that 10-point lead early in the quarter to three at 47-44. Arnold made one of two at the free throw line to manage that. At the other end, however, Walker converted twice at the line. Hannah Ogilvie kept it tight with a basket off an offensive rebound. In turn, Atkins converted a free throw to make it a two-possession game, 50-46. And Trotter came back with a crucial steal after teammate’s McKenzie Muse and Celena Martin had trapped a Cabot player in the corner. With :51.7 remaining, Trotter made one of her two free throws, pushing the margin to 51-46. Trotter was fouled again at the :17.4 mark and coolly nailed both free throws to push the lead to 5. Must and Allison Steen combined to force a turnover as the Lady Hornets closed out the victory. “We hit enough,” Matthews said of the free-throw shooting. “You know, this exact game last year, we missed a couple in regulation then pulled it out in overtime. We’re not looking for perfect kids. We gave great effort tonight and made enough plays down the stretch to win. “I thought we were able to force their tempo a little bit, force their rhythm,” he mentioned. Trotter hit a 3 and Atkins hit two from long range in the first quarter and the game was tied at 9 before Walker beat the buzzer with a layup off a steal by Steen to put the Lady Hornets ahead. 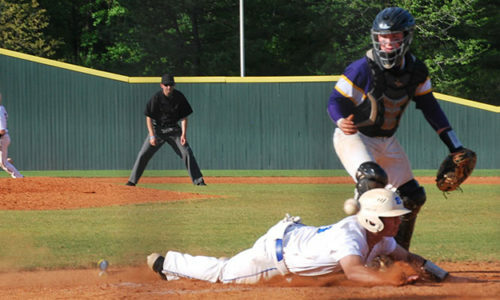 The game was tied at 12 and 14 with Cabot in position to regain the lead. But Walker made a steal that led to a trip to the free-throw line for Robyn Gordon, who was fouled going after an offensive rebound. She converted her first shot then missed the second only to have teammate Ivory Russ power for the carom. She scored and was fouled. Her free throw had Bryant up 18-14. Wilson scored off the offensive glass for Cabot, but Walker hit a 3. Wilson answered with a triple to spark a surge that produced a 23-21 lead for the Lady Panthers with 2:56 left in the half. But they didn’t score the rest of the way. Off a kick-out from Gordon, Walker nailed another trey then Martin popped one form the left wing. Walker again hit a layup off a turnover in the final seconds and Bryant suddenly had the biggest lead of the game 29-23. After shooting just five free throws in the first half, the Lady Hornets attempted 15 in the second half. Trotter scored on a driving jumper to start the third quarter, extending the lead to 8. Cabot kept having success getting open looks from 3-point range in the corners against the Lady Hornets’ match-up zone. But they struggled to hit them. Wilson hit a pair in the third quarter and would add another during the fourth-quarter rally. In the third quarter, Arnold knocked down a pair but, other than that, the Lady Panthers were 0-for-20 on 3’s. Arnold’s 3’s came on consecutive possessions and had her team within 2, 31-29. Trotter answered for Bryant but, inside, Emily Belin scored. At the 2:20 mark, Stracener, who was 0 for 6 from 3 and 4 of 8 at the free-throw line missed both shots as the Lady Hornets maintained the upper hand. Though Atkins made a free throw, Benin tied it at 34. The Lady Panthers had two trips to the charity stripe to take the lead but came up empty on three shots. That’s when Walker started the Bryant run that produced the 10-point advantage. Adding to that was a couple of big baskets by Muse, who was scoreless up to then. She hit an 18-footer to open the scoring in the final period then, on the heels of Walker’s 3, hit one herself to make it 44-34. On Tuesday, Bryant travels to North Little Rock. Cabot hosts top-ranked Fort Smith Northside. Stracener 3-12 4-8 10, Nichols 0-1 0-0 0, Arnold 4-11 0-0 10, Ogilvie 2-6 0-0 4, Belin 3-9 0-0 6, McDonald 1-1 0-0 2, Wilson 5-13 3-6 16, Ball 0-2 0-0 0, Davis 0-0 0-0 0. Totals18-55 (33%) 9-14 (64%) 48. Trotter 3-9 4-9 11, Atkins 2-7 3-6 9, Martin 1-1 0-0 3, Gordon 1-2 1-2 3, Muse 2-8 0-0 5, Walker 6-14 2-2 17, Steen 1-3 0-0 2, Russ 1-1 1-1 3, Taylor 0-2 0-0 0. Totals17-47 (36) 11-20 (55%) 53. Three-point field goals:Bryant 8-23 (Walker 3-9, Atkins 2-5, Trotter 1-4, Muse 1-4, Martin 1-1), Cabot 5-25 (Wilson 3-10, Arnold 2-6, Stracener 0-6, Ball 0-2, Nichols 0-1). Turnovers:Bryant 12, Cabot 19.Rebounds:Bryant 8-20 28 (Steen 2-5 7, Trotter 0-3 3, Atkins 1-2 3, Muse 1-2 3, Walker 0-3 3, Martin 1-1 2, Gordon 1-1 2, Russ 1-1 2, team 1-2 2), Cabot 17-26 43 (Belin 4-6 10, Stracener 2-7 9, Arnold 2-3 5, Ogilvie 3-1 4, Wilson 1-3 4, Nichols 0-2 2, Davis 0-2 2, team 5-4 9). 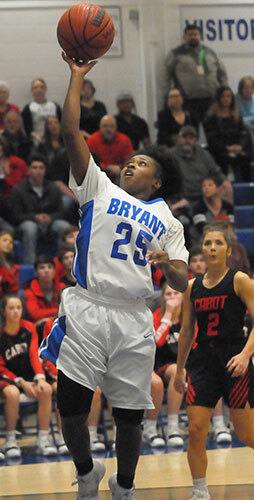 Team fouls:Bryant 15, Cabot 20. Techincal foul:Bryant, Russ. Fouled out:Cabot, Wilson.